Prague is a city of incredible wealth. 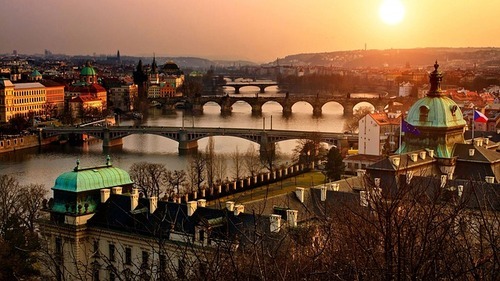 If it is nicknamed "the city with a hundred steeples", the Czech capital is also today one of the most touristic and most beautiful cities in Europe. The beauty and variety of its cultural, historical, artistic and architectural heritage, the multitude of activities, leisure activities and outings make it a city as exceptional as it is incomparable. Why go to Prague? What to do, what to see and what to visit in Prague starting with the must-sees? What do you need to know before you go to prepare your trip to Prague at best and succeed? Prague charm in all seasons. Under the sun and the heavy heat of continental summers as under the snow that sometimes adorns the cobblestones and roofs of his immaculate mantle. Or under the mist and under a gray, rainy sky that everywhere else would be depressing. Prague is always able to reveal, like no other, its shadows and its lights, its mysteries and its legends, its treasures and its facets. Of course, it is always possible to arrive in Prague without a reservation in view of the impressive number of accommodation facilities for all types of travelers. There are all types of accommodation in Prague at all prices from 7-10 € per person and cheap accommodation, 20-25 € in apartment, 35-45 € in 3 * hotel. For a minimum of comfort, count instead from 20-25 € per person per day in bed and breakfast and in some pensions. Czech cuisine dining in PragueCzech cuisine in Prague is not always the best, considering the massive tourism that has resulted in a degradation of the quality of the dishes served in the restaurants especially in the big center as on the place Stare Namesti or in surroundings. However, the cuisine in Prague is a representative synthesis of Bohemian Czech cuisine. Do not miss a goulash (goulash), a kind of thick soup made from paprika and beef, which is native to Hungary but also very present in the Czech Republic.